Download "SCHOOL OF ELECTRONICS AND COMPUTER SCIENCE"
1 SCHOOL OF ELECTRONICS AND COMPUTER SCIENCE Information systems and software engineering are the key disciplines that ensure effective modelling, definition of requirements and specification, and the efficient design and construction of all software-based systems, products and services. These two disciplines also enable the effective introduction of software-based systems into the marketplace or the organisational enterprise. Many courses within the School of Electronics and Computer Science focus on the creative application of computing in areas such as design, simulation and visualisation. The technical, managerial and business skills of the professional software engineer and information systems practitioner ensure the effective delivery of these systems. Courses emphasise the theoretical as well as the practical challenges of producing successful systems for a wide range of applications in the manufacturing and service industries. All courses employ industrial standard state-of-the-art principles, methodologies and practice providing students with a portfolio of highly marketable skills. Electronic systems are at the heart of every aspect of modern life. They enable us to track the movement of objects from a satellite, to control cars, planes and trains to make maximum use of energy resources, and to produce equipment for people with disabilities. It takes highly creative and analytical people to make the technological advances demanded in the modern world, and the courses offered are designed to provide this edge. Strong numeracy skills and flexible minds are required, along with the ability to see beyond the boundaries of the possible and take leaps of imagination. How do you put millions of transistors on a single silicon chip so they work first time? How do you evaluate your position to within metres using satellites thousands of kilometres away? Academic staff and researchers have been actively engaged in the rapid development of these technologies - helping to develop voice synthesisers for the British Telecom service, automatic sound synchronisation for modern movies, microelectronic circuits for mobile phones, and receivers for CD-quality digital audio broadcasts; manipulating sounds and images as streams of digital numbers and microwaves; and handling signals oscillating billions of times per second. Courses are accredited by the two relevant professional institutions in the field of informatics: the Institution of Engineering and Technology (IET) (formerly the IEE) and the British Computer Society (BCS). Teaching is supported by over 300 workstations and over 20 laboratories providing access to Unix, Novell and NT servers, all supported by high-bandwidth networks and a strong team of specialist technicians to ensure you get the most out of these technologies. 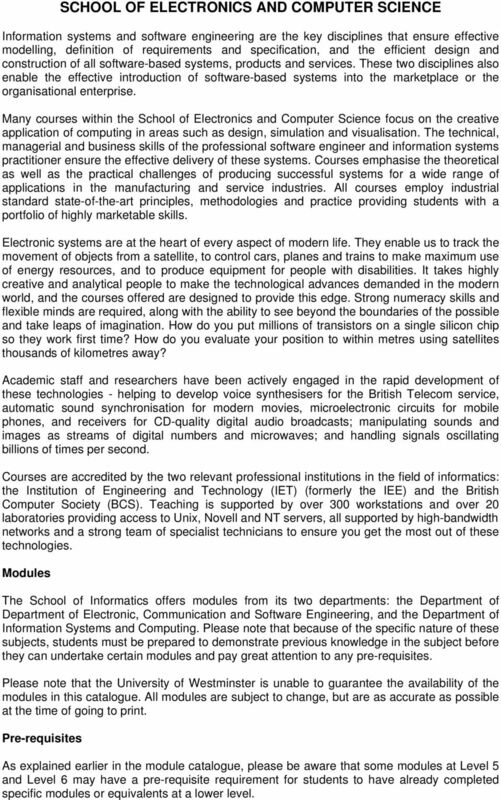 Modules The School of Informatics offers modules from its two departments: the Department of Department of Electronic, Communication and Software Engineering, and the Department of Information Systems and Computing. Please note that because of the specific nature of these subjects, students must be prepared to demonstrate previous knowledge in the subject before they can undertake certain modules and pay great attention to any pre-requisites. Please note that the University of Westminster is unable to guarantee the availability of the modules in this catalogue. All modules are subject to change, but are as accurate as possible at the time of going to print. Pre-requisites As explained earlier in the module catalogue, please be aware that some modules at Level 5 and Level 6 may have a pre-requisite requirement for students to have already completed specific modules or equivalents at a lower level. 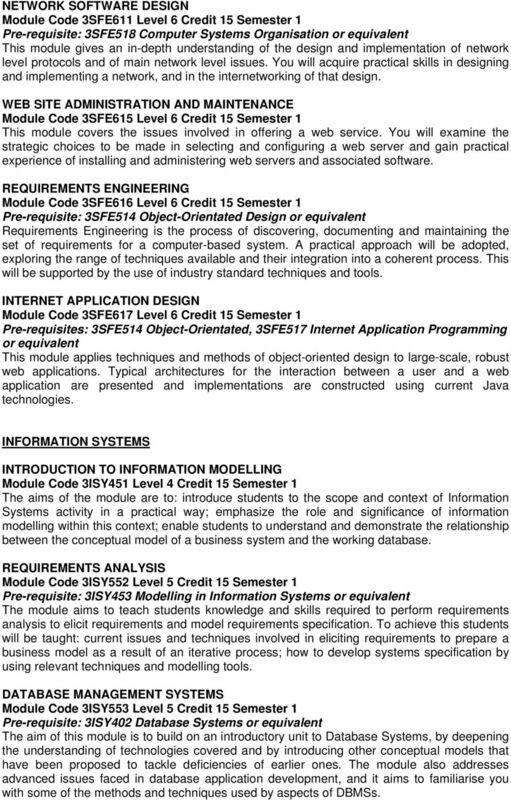 3 SOFTWARE ENGINEERING COMPUTER ORGANISATION Module Code 3SFE401 Level 4 Credit 15 Semester 1 Co-requisite: Database Systems 3ISY402 or equivalent This module would suit students with a general academic background in Software Engineering. The module introduces you to the software levels of autonomous computers and of networks. The module consists of simple practical use of command-line and GUI interfaces; an appreciation of how the lower software levels support and implement user commands; and a discussion of the implementation of basic data types, of structure statements and functions of block-structured computer application languages. PROGRAMMING METHODOLOGY Module Code 3SFE402 Level 4 Credit 15 Semester 1 Co-requisite: Database Systems 3ISY402 or equivalent This module would suit students with a general academic background in computer programming. This module provides a practical introduction to imperative programming in a strongly-typed language. The control structures and data types of structured programming will be introduced, together with other relevant aspects of the language used as a vehicle for teaching. You will gain practical experience of appropriate program development tools, and will be expected to write programs conforming to given stylistic guidelines. 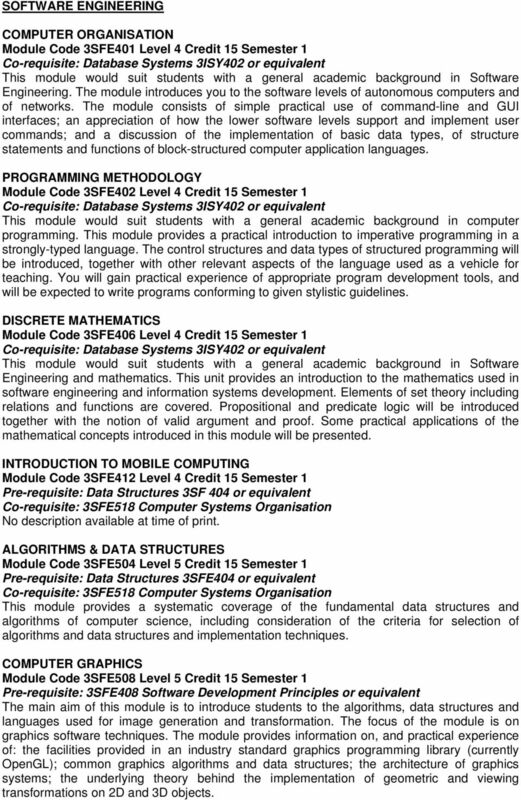 DISCRETE MATHEMATICS Module Code 3SFE406 Level 4 Credit 15 Semester 1 Co-requisite: Database Systems 3ISY402 or equivalent This module would suit students with a general academic background in Software Engineering and mathematics. This unit provides an introduction to the mathematics used in software engineering and information systems development. Elements of set theory including relations and functions are covered. Propositional and predicate logic will be introduced together with the notion of valid argument and proof. Some practical applications of the mathematical concepts introduced in this module will be presented. INTRODUCTION TO MOBILE COMPUTING Module Code 3SFE412 Level 4 Credit 15 Semester 1 Pre-requisite: Data Structures 3SF 404 or equivalent No description available at time of print. ALGORITHMS & DATA STRUCTURES Module Code 3SFE504 Level 5 Credit 15 Semester 1 Pre-requisite: Data Structures 3SFE404 or equivalent This module provides a systematic coverage of the fundamental data structures and algorithms of computer science, including consideration of the criteria for selection of algorithms and data structures and implementation techniques. COMPUTER GRAPHICS Module Code 3SFE508 Level 5 Credit 15 Semester 1 Pre-requisite: 3SFE408 Software Development Principles or equivalent The main aim of this module is to introduce students to the algorithms, data structures and languages used for image generation and transformation. The focus of the module is on graphics software techniques. The module provides information on, and practical experience of: the facilities provided in an industry standard graphics programming library (currently OpenGL); common graphics algorithms and data structures; the architecture of graphics systems; the underlying theory behind the implementation of geometric and viewing transformations on 2D and 3D objects. 4 INTERNET APPLICATION PROGRAMMING Module Code 3SFE517 Level 5 Credit 15 Semester 1 Pre-requisites: 3SFE407 Introduction to Internet Programming, 3SFE408 Software Development Principles or equivalent This module introduces you to the principles and practice of programming internet applications and extends your understanding of the architecture of the World-Wide Web through programming of substantial, realistic examples of internet applications. COMPUTER SYSTEMS ORGANISATION Module Code 3SFE518 Level 5 Credit 15 Semester 1 Pre-requisite: 3SFE408 Software Development Principles or equivalent The module introduces the structural and operational features of operating systems and networks and gives you practical skills in low-level programming with such systems. 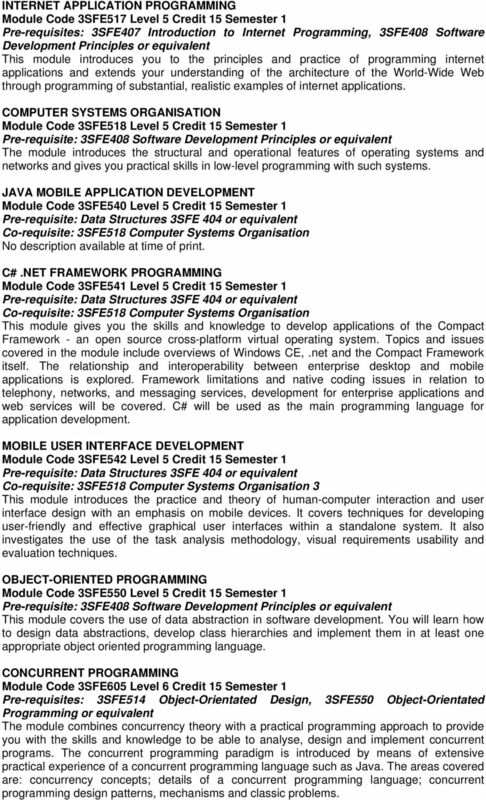 JAVA MOBILE APPLICATION DEVELOPMENT Module Code 3SFE540 Level 5 Credit 15 Semester 1 No description available at time of print. C#.NET FRAMEWORK PROGRAMMING Module Code 3SFE541 Level 5 Credit 15 Semester 1 This module gives you the skills and knowledge to develop applications of the Compact Framework - an open source cross-platform virtual operating system. Topics and issues covered in the module include overviews of Windows CE,.net and the Compact Framework itself. The relationship and interoperability between enterprise desktop and mobile applications is explored. Framework limitations and native coding issues in relation to telephony, networks, and messaging services, development for enterprise applications and web services will be covered. C# will be used as the main programming language for application development. MOBILE USER INTERFACE DEVELOPMENT Module Code 3SFE542 Level 5 Credit 15 Semester 1 3 This module introduces the practice and theory of human-computer interaction and user interface design with an emphasis on mobile devices. It covers techniques for developing user-friendly and effective graphical user interfaces within a standalone system. It also investigates the use of the task analysis methodology, visual requirements usability and evaluation techniques. OBJECT-ORIENTED PROGRAMMING Module Code 3SFE550 Level 5 Credit 15 Semester 1 Pre-requisite: 3SFE408 Software Development Principles or equivalent This module covers the use of data abstraction in software development. You will learn how to design data abstractions, develop class hierarchies and implement them in at least one appropriate object oriented programming language. CONCURRENT PROGRAMMING Module Code 3SFE605 Level 6 Credit 15 Semester 1 Pre-requisites: 3SFE514 Object-Orientated Design, 3SFE550 Object-Orientated Programming or equivalent The module combines concurrency theory with a practical programming approach to provide you with the skills and knowledge to be able to analyse, design and implement concurrent programs. The concurrent programming paradigm is introduced by means of extensive practical experience of a concurrent programming language such as Java. The areas covered are: concurrency concepts; details of a concurrent programming language; concurrent programming design patterns, mechanisms and classic problems. 5 NETWORK SOFTWARE DESIGN Module Code 3SFE611 Level 6 Credit 15 Semester 1 Pre-requisite: 3SFE518 Computer Systems Organisation or equivalent This module gives an in-depth understanding of the design and implementation of network level protocols and of main network level issues. You will acquire practical skills in designing and implementing a network, and in the internetworking of that design. WEB SITE ADMINISTRATION AND MAINTENANCE Module Code 3SFE615 Level 6 Credit 15 Semester 1 This module covers the issues involved in offering a web service. You will examine the strategic choices to be made in selecting and configuring a web server and gain practical experience of installing and administering web servers and associated software. REQUIREMENTS ENGINEERING Module Code 3SFE616 Level 6 Credit 15 Semester 1 Pre-requisite: 3SFE514 Object-Orientated Design or equivalent Requirements Engineering is the process of discovering, documenting and maintaining the set of requirements for a computer-based system. A practical approach will be adopted, exploring the range of techniques available and their integration into a coherent process. This will be supported by the use of industry standard techniques and tools. INTERNET APPLICATION DESIGN Module Code 3SFE617 Level 6 Credit 15 Semester 1 Pre-requisites: 3SFE514 Object-Orientated, 3SFE517 Internet Application Programming or equivalent This module applies techniques and methods of object-oriented design to large-scale, robust web applications. Typical architectures for the interaction between a user and a web application are presented and implementations are constructed using current Java technologies. INFORMATION SYSTEMS INTRODUCTION TO INFORMATION MODELLING Module Code 3ISY451 Level 4 Credit 15 Semester 1 The aims of the module are to: introduce students to the scope and context of Information Systems activity in a practical way; emphasize the role and significance of information modelling within this context; enable students to understand and demonstrate the relationship between the conceptual model of a business system and the working database. REQUIREMENTS ANALYSIS Module Code 3ISY552 Level 5 Credit 15 Semester 1 Pre-requisite: 3ISY453 Modelling in Information Systems or equivalent The module aims to teach students knowledge and skills required to perform requirements analysis to elicit requirements and model requirements specification. To achieve this students will be taught: current issues and techniques involved in eliciting requirements to prepare a business model as a result of an iterative process; how to develop systems specification by using relevant techniques and modelling tools. DATABASE MANAGEMENT SYSTEMS Module Code 3ISY553 Level 5 Credit 15 Semester 1 Pre-requisite: 3ISY402 Database Systems or equivalent The aim of this module is to build on an introductory unit to Database Systems, by deepening the understanding of technologies covered and by introducing other conceptual models that have been proposed to tackle deficiencies of earlier ones. The module also addresses advanced issues faced in database application development, and it aims to familiarise you with some of the methods and techniques used by aspects of DBMSs. 6 INTRODUCTION TO PROGRAMMING Module Code 3ISY557 Level 5 Credit 15 Semester 1 Pre-requisite: 3ISY453 Modelling in Information Systems or equivalent The module provides a comprehensive hands-on introduction to imperative programming using Java. You will be introduced to both traditional and modern style programming with a graphical user interface. The module is focused on fundamentals of Java programming language along with hands-on experience on the process of Object-Oriented analysis and design. INTERACTIVE MARKETING Module Code 3ISY599 Level 5 Credit 15 Semester 1 Pre-requisites: Knowledge of VB programming language and Microsoft Visual Studio Development Environment The module aims to provide the students with an introduction to marketing concepts and apply these in a practical context using web-based technologies. Students will also develop an understand of, and apply, some of the techniques used in market research in a business context. DESIGNING INFORMATION SYSTEMS Module Code 3ISY651 Level 6 Credit 15 Semester 1 Pre-requisites: 3SFE551 Requirements Analysis or equivalent, Knowledge of requirements, unified modelling language and Java (or similar) programming language The module aims to equip students to make an informed choice about the best approach to systems development for an individual system. It will enable them to evaluate the results of the requirements analysis and use them to produce a coherent systems design. SOFTWARE QUALITY MANAGEMENT Module Code 3ISY654 Level 6 Credit 15 Semester 1 Pre-requisite: 3ISY509 Project Management The module will provide you with an understanding of the importance of Software Quality Assurance (SQA) and the need to manage the software development process within the information systems project management framework. The aim is to identify and understand the procedures involved when aiming for a software quality management accreditation. BUSINESS SYSTEMS MANAGEMENT AND EVALUATION Module Code 3ISY655 Level 6 Credit 15 Semester 1 This module will provide you with an understanding of the implications of managerial decisions applied to identifying the needs for, and the development of an information system taking a strategic management perspective in relation to evaluating investment in IS/IT. 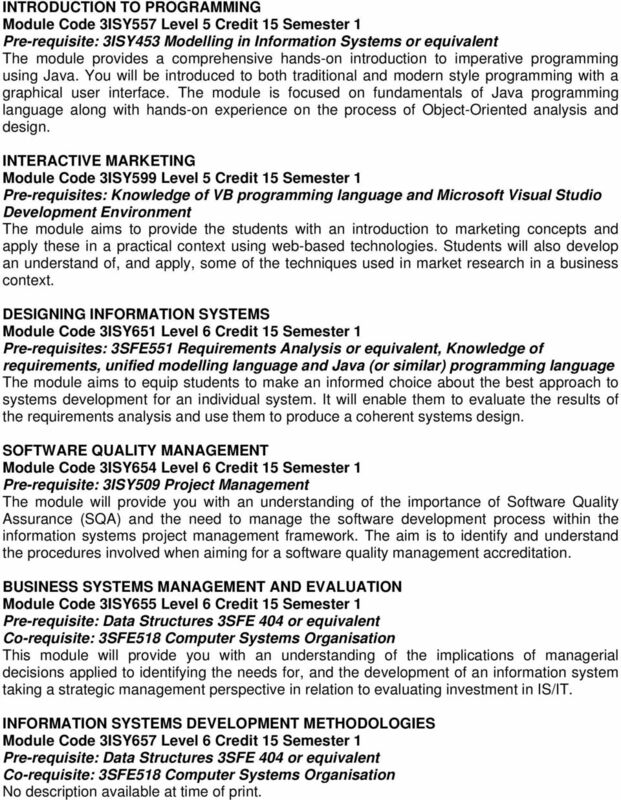 INFORMATION SYSTEMS DEVELOPMENT METHODOLOGIES Module Code 3ISY657 Level 6 Credit 15 Semester 1 No description available at time of print. 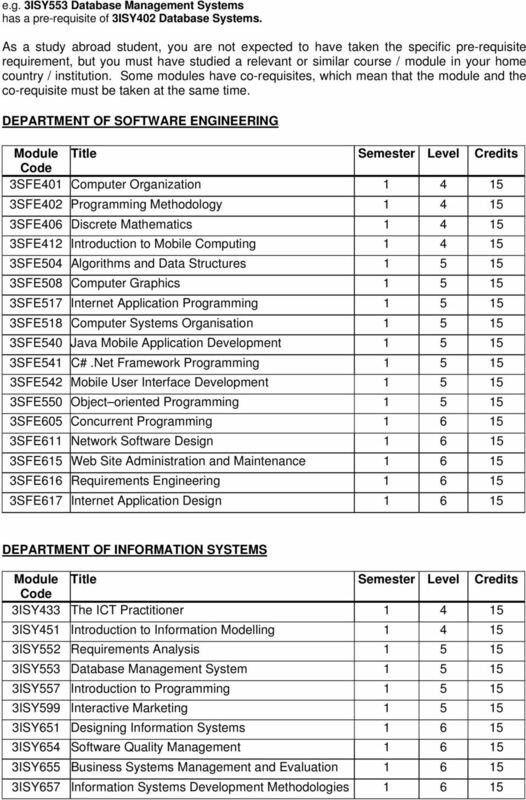 Bachelor of Information Technology Detailed Course Requirements The 2016 Monash University Handbook will be available from October 2015. This document contains interim 2016 course requirements information. The Norwegian School of Information Technology Index About NITH...2 Curriculum...2 Bachelor Information Systems...3 1. year...3 2. year...3 3. year...4 Bachelor Information Technology...6 1. year...6 2. COMPUTER SCIENCE/ COMPUTER NETWORKING AND TECHNOLOGIES (COSC) Computer Science (COSC) courses are offered by the School of Information Arts and Technologies within the Yale Gordon College of Liberal Arts. Information Systems. Administered by the Department of Mathematical and Computing Sciences within the College of Arts and Sciences. COURSE TITLE COURSE DESCRIPTION CS-00X COMPUTING EXIT INTERVIEW All graduating students are required to meet with their department chairperson/program director to finalize requirements for degree completion. A TOP-RATED UNIVERSITY FOR EMPLOYABILITY. MSc IT for the Oil and Gas Industry. T: 01224 262787 262705 h.ahriz@rgu.ac.uk. d.p.lonie@rgu.ac. 2. Basis for computing design and implementation at all levels through OS, distributed systems, human interface and computer graphics.